​Dear God, when WILL they end? 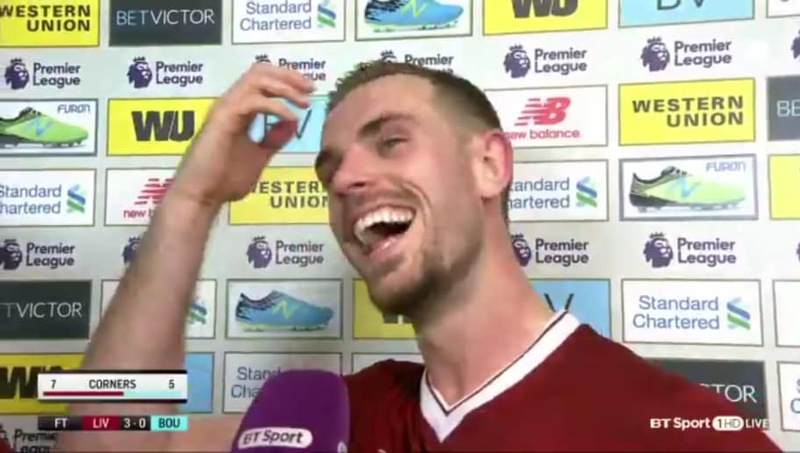 ​Liverpool captain Jordan Henderson took up interviewing duties ​following the club's comfortable 3-0 victory over Bournemouth on Saturday evening, and things started off pretty normal. Reds talisman Mohamed Salah got himself on the scoresheet yet again with a wonderful looping header - his 40th in all competitions this season - prompting BT reporter Des Kelly to ask the England international about the Egyptian. Now, unless you've been living under a rock, you will know that ​Tottenham striker Harry Kane was bafflingly awarded Christian Eriksen's goal against ​Stoke last weekend, despite replays indicating he got no touch on it whatsoever. That was after Kane and the club lodged an appeal to the ​Premier League and were somehow successful, meaning he now sits on 25 league goals for the season so far. The worst thing undoubtedly to come from the situation is that the 'Harry Kane tried to claim that' jokes are already the most over-used jokes in human history, and will continued to be used unashamedly. Salah himself took to the social site to express his disbelief at the award of the goal to Kane, writing: "Wooooooow really ?" You could almost see the joy in Henderson's eyes as he was asked to comment on Salah's goalscoring. Taking a deep breath in preparation of some cutting original banter, he said: "He told me he's going to claim all of them."